Summer reading. Two words that virtually guarantee eye-rolling from my two stubborn boys. When that final bell rings on the last day of school this month, all Brady and Eli want to think about is pool time, hanging out with friends, sleeping in, and basketball camp. Reading a book is the absolute last thing (and I mean last thing) on their minds. I happen to be a reading specialist, so I can’t tell you how sad it is to have two boys who didn’t inherit my same passion for reading. They manage to make it through the school year reading books, but summertime can get a little dicey. Routines are changed, vacations are planned, and sometimes regularly scheduled reading time gets put on the back burner. The dog days of summer require me to step up my A game. Here are a few suggestions to help your kiddos jump on board the summer reading train – and actually like where they are going! Trick 1: Involve your child’s teacher and school. The other day, Eli asked me to go to the library and pick up a book for him. I almost fell out of my chair. He wanted to check out a book from a series that his superstar second-grade teacher has been reading to the class. Kids really don’t care what their parents like to read. We are boring. However, they care immensely about what their teachers like. Before summer starts, ask your child’s teacher for a list of what they would recommend for your kiddo to read. If you happen to be a dynamic planner, you can even attach a little note from the teacher endorsing the book. There are few things more exciting to a child than getting a note from a teacher in the middle of the summer. Many schools in the area also offer their own summer reading incentive programs, so before the last day of school, make sure you are up-to-date on what your child’s school will be doing to encourage students to keep reading. Online resources for parents and students are also available on school division websites to encourage reading. At the start of the new school year, many schools celebrate student reading success, so keep reminding your kids about this over the summer. My sons might not want to sit down and read now, but trust me, they will be upset if they miss the chance to attend the celebration that’s usually held the first or second week of school. Trick 2: Make the library a part of your summer routine. The local libraries go all out in the summertime, offering fun contests, activities, and events for students all across the area. This summer, the Henrico County Public Library wants to ensure their kids are transformed into super readers by reading for at least twenty days over the summer. Their theme, “Every Hero Has a Story,” will allow children to win exciting prizes, like Kings Dominion passes and even a GoPro, just for keeping up with their reading logs and attending fun events at their local branches. Chesterfield County Public Library is focusing on strengthening children’s relationships with their local libraries, setting kids up for a lifetime of learning. Not only will CCPL be offering super-cool prizes and awesome events, students who reach their reading goals will be named Summer Learning Program Champions and awarded special edition library cards. The Richmond Public Library system and Pamunkey Regional Library branches also have a ton of reading incentives planned for children of all ages, starting with their awesome summer reading programs. Turn your kids into reading champions (or heroes) by picking the same day each week to go and check out books. Remember, most branches have evening hours during the week, so working parents can hit the library with their kids after dinner. Trick 3: Bookstores are fun. Of course, I can’t contain my excitement when I walk into a bookstore. Endless rows of new, fresh-smelling books await me, ready to be opened and savored. I could stay in there for hours, but of course, my boys would love to go anywhere but a bookstore. 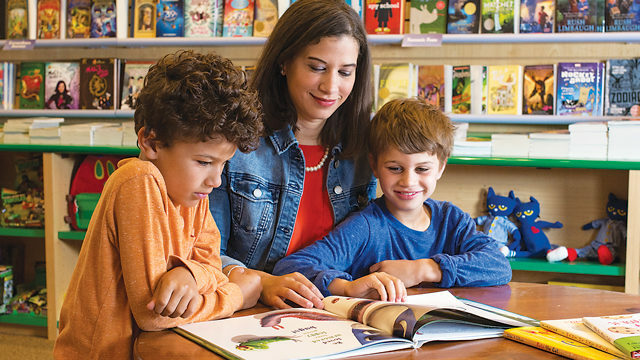 Thankfully, stores like Barnes & Noble and BBGB also know how to wrangle young readers into the stacks with story times and exciting in-store programming like Harry Potter parties, author appearances, and LEGO-building events. Barnes & Noble also has its own summer reading program where kids can win books just for reading and filling out their logs. If this doesn’t excite your kids, come up with your own in-store scavenger hunt to look for a book with a certain animal, or super hero, or whatever interests them. At the end, let your kids choose one of the books they’ve found to buy and take home. Trick 4: Transform trips into opportunities for reading. to check out books about other countries. Brady enjoyed What Was Pompeii? by Jim O’Connor. Tour local Civil War museums and get your kids to read about the hunt for John Wilkes Booth in Chasing Lincoln’s Killer by James L. Swanson. Plan a visit to Jamestown and Colonial Williamsburg and have your older kids check out Blood on the River by Elisa Carbone, and If You Lived in Williamsburg in Colonial Days by Barbara Brenner for your younger ones. Kids enjoy making connections with things they have seen and learned about. It can ignite a fire inside of them to want to find out even more. Trick 5: Host a book swap. Have your kids gather a bunch of their old books and host a book-swapping party. It can be with the kids in your neighborhood, your friends’ kids, cousins, strangers, whomever! Kids love having the chance to trade their stuff for other kids’ stuff. You can have them wrap the books to make it even more interesting. Unwrapping presents, even if they are just books (eye-rolling here), is always fun! Read aloud to your kids! Read aloud to them when they are in the bath, at the dinner table, or shooting hoops in the driveway. Read aloud to them when they are coloring, when they are playing with their toys, and when you are tucking them in at night. It is by far the most important activity a parent can do with a child to encourage future reading success. Make it a family affair and have a reading party every night in the summer. Get blankets, pillows, and popcorn and read together in the family room with just flashlights. I guarantee this is way more fun than watching a movie together. When you need a break from reading, grab books on CD (at the library) and listen to them all summer long in the car. My boys might run and hide if they have to read by themselves, but some of their favorite Mom-and-me memories come from snuggling up in their beds as I read the best boy books I could find.